Bryan’s Review of ‘The Raven’!!! I’ve been a fan of Edgar Allan Poe for as long as I can remember, and I have always loved watching films about his life, tales, and poems. I was particularly excited when I heard that James McTeigue was going to direct ‘The Raven’, a murder-mystery that posits a fictional explanation for Poe’s mysterious death. Unfortunately, while the main idea for the story is original and had the potential to be one of the better murder-mysteries made, ‘The Raven’ was just a series of unexciting plot twists that made me quote, ‘Nevermore’. A few months months prior to his death, Poe (John Cusack) is in 19th century Maryland, barely making ends meet living off of past royalties from his famous poems and short stories. He no longer writes fiction or poetry, refusing to give in to his reader’s insatiable desire for his gruesome gothic tales. He now spends his days drinking heavily, writing vehement (and many times unpublishable) literary critiques for a local newspaper, and pursuing the young Emily Hamilton (Alice Eve) despite her father’s disapproval. A couple of murders come to light that replicate some of Poe’s more violent and gothic works. The police enlist Poe to help them solve the murders. And much like the movie, ‘Se7en’, the killer continues to kill, leaving clues for the police and Poe to keep them hot on his trail. At first, Poe only takes a slight interest in the murders. But when his true love (Emily Hamilton) is kidnapped by the murderer, he devotes himself to solving the mystery. That may sound like a recipe for a great film, but it never really gains momentum and ultimately deflates as unachieved potential. The relationships between many of the characters were also stiff and unnatural. For example, Poe becomes the buddy cop to Detective Fields (Luke Evans), the head detective on the serial murder case. One cannot help but compare the Poe-Fields relationship with the Holmes-Watson relationship in the recent Sherlock Holmes movies. Unfortunately, the friendship in ‘The Raven’ lacks any chemistry and is only a meek echo of Holmes and Watson. Sadly, the mystery killer was also anti-climactic. Introduced only at the very end of the film, the villain lacked any real motive other than insane fanaticism for Poe’s work. He came across as over-the-top creepy. Also, his ability to stealthily sneak past a well-guarded party, kidnap people, outrun anyone and anything, and shoot with perfect aim made the unknown killer seem invincible. Perhaps his identity should have remained a mystery. When he was finally revealed, he was no more cunning than Poe and was wimpy at best. 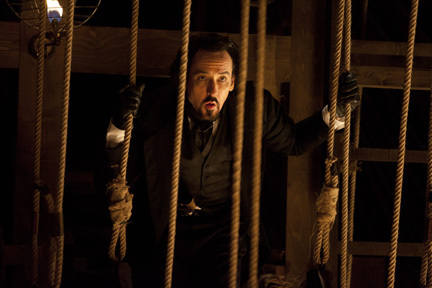 One of the best things I liked about ‘The Raven’ was John Cusack. He created a new version of Poe that I hadn’t seen before, and it was probably one of the best. Cusack played Poe with tons of wit and dry humor. He was a jokester, a drunk, and full of himself. I even saw a hint of his character from ‘High Fidelity’ make its way into his Poe character. McTeigue directed ‘V for Vendetta’, which had some amazing characters, great acting, and some brilliant action sequences. Sadly, almost all of that was non-existent in ‘The Raven’. ‘The Raven’ misses the mark and is easily forgettable. I wish it wasn’t, because they had a great plot line and some good actors. Although we don’t get many whodunnit murder mystery films these days, I wouldn’t recommend this for the full price of admission. That being said, it might make a decent week-night DVD rental. 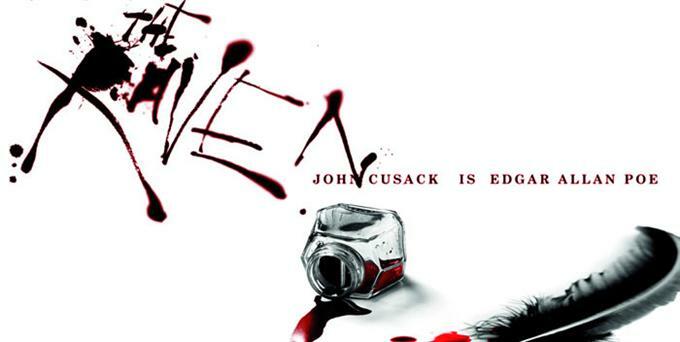 There’s a Poster For Edgar Allan Poe’s ‘The Raven’ Starring John Cusack!!! ‘Nevermore’!!! Check out ‘The Raven’ Trailer Complete With John Cusack!! This entry was posted on Monday, May 14th, 2012 at 6:05 pm	and is filed under Film, News. You can follow any responses to this entry through the RSS 2.0 feed. You can skip to the end and leave a response. Pinging is currently not allowed. « Bryan’s Review of ‘Sound of My Voice’!!! SEE THIS MOVIE!! As I was going to St. Ives, / I met a man with seven wives. / Every wife had seven sacks, / Every sack had seven cats, / Every cat had seven kittens. / Kittens, cats, sacks, wives, / How many were going to St. Ives?